Last Saturday and Sunday I made an apostolic journey to Morocco, invited by His Majesty King Mohammed VI. To him and to the other Moroccan authorities I renew my gratitude for the warm welcome and for all the collaboration, especially to the King: he was so fraternal, so close, so close. I especially thank the Lord, who allowed me to take another step on the path of dialogue and encounter with the Muslim brothers and sisters, to be - as the motto of the Journey said - «Servant of hope» in today's world. My pilgrimage has followed in the footsteps of two Saints: Francis of Assisi and John Paul II. 800 years ago Francis brought the message of peace and fraternity to the Sultan al-Malik al-Kamil; in 1985 Pope Wojtyła made his memorable visit to Morocco, having received at the Vatican - first among the Muslim Heads of State - King Hassan II. But some may ask: but why does the Pope go to the Muslims and not only to the Catholics? Why are there so many religions, and why are there so many religions? With Muslims we are descendants of the same Father, Abraham: why does God allow so many religions? God wanted to allow this: Scholastic theologians referred to the permissive voluntas of God. He wanted to allow this reality: there are so many religions; some are born of culture, but always look at the sky, they look at God. But what God wants is fraternity between us and in a special way - here is the reason for this journey - with our brothers children of Abraham like us, the Muslims. We must not be afraid of the difference: God has allowed this. We must be frightened if we do not work in fraternity, to walk together in life. Serving hope, in a time like ours, means first of all building bridges between civilizations. And for me it was a joy and an honor to be able to do it with the noble Kingdom of Morocco, meeting his people and their rulers. Recalling some important international summits that took place in that country in recent years, we reiterated with King Mohammed VI the essential role of religions in defending human dignity and promoting peace, justice and care for creation, that is our home common. In this perspective we have also signed an Appeal for Jerusalem together with the King, so that the Holy City may be preserved as a patrimony of humanity and a place of peaceful meeting, especially for the faithful of the three monotheistic religions. I visited the Mausoleum of Mohammed V, paying tribute to the memory of him and Hassan II, as well as the Institute for the training of imams, preachers and preachers. This Institute promotes an Islam that is respectful of other religions and rejects violence and fundamentalism, that is, it emphasizes that we are all brothers and we must work for fraternity. I paid particular attention to the migration issue, both speaking to the Authorities, and especially in the meeting specifically dedicated to migrants. Some of them testified that the life of those who emigrate changes and returns to being human when they find a community that welcomes them as a person. This is fundamental. Just in Marrakech, Morocco, last December the "World Pact for a secure, orderly and regular migration" was ratified. An important step towards taking responsibility for the international community. As Holy See we have offered our contribution which is summarized in four verbs: welcoming migrants, protecting migrants, promoting migrants and integrating migrants. It is not a question of lowering welfare programs from above, but of making a journey together through these four actions, to build cities and countries that, while preserving their respective cultural and religious identities, are open to differences and know how to value them in the name of human brotherhood . The Church in Morocco is very committed to being close to migrants. I don't like to say migrants; I like to say more about migrant people. Do you know why? Because migrant is an adjective, while the term person is a noun. We have fallen into the adjective culture: we use many adjectives and often forget the nouns, that is the substance. The adjective must always be linked to a noun, to a person; therefore a migrant person. So there is respect and we don't fall into this adjective culture that is too liquid, too "gaseous". The Church in Morocco, I said, is very committed to being close to migrant people, and so I wanted to thank and encourage those who generously spend themselves in their service by fulfilling the word of Christ: "I was a stranger and you welcomed me" (Mt 25:35 ). Sunday was dedicated to the Christian community. First of all, I visited the Rural Social Services Center, run by the Daughters of Charity nuns, the same ones that make the dispensary and the children's clinic here in Santa Marta, and these sisters work with the collaboration of numerous volunteers , offer different services to the population. In the Cathedral of Rabat I met the priests, consecrated persons and the World Council of Churches. It is a small flock in Morocco, and for this I recalled the Gospel images of salt, light and leaven (see Mt 5: 13-16; 13:33) which we read at the beginning of this audience. What matters is not the quantity, but that the salt tastes, that the light shines, and that the yeast has the strength to make the whole mass ferment. And this does not come from us, but from God, from the Holy Spirit who makes us witnesses of Christ where we are, in a style of dialogue and friendship, to be lived first of all among us Christians, because - says Jesus - "by this all will know that you are my disciples: if you have love for one another "(Jn 13:35). And the joy of ecclesial communion found its foundation and full expression in the Sunday Eucharist, celebrated in a sports complex in the capital. Thousands of people of about 60 different nationalities! A singular epiphany of the People of God in the heart of an Islamic country. The parable of the merciful Father has made shine in our midst the beauty of God's design, which wants all his children to take part in his joy, at the feast of forgiveness and reconciliation. At this feast come those who know how to recognize themselves in need of the Father's mercy and who know how to rejoice with Him when a brother or sister returns home. It is no coincidence that, where Muslims invoke the Clement and the Merciful every day, the great parable of the Father's mercy resounded. This is so: only those who are reborn and live in the embrace of this Father, only those who feel they are brothers can be servants of hope in the world. I greet the English-speaking pilgrims and visitors taking part in today’s Audience, especially those from England, Scotland, Ireland, Australia, China, the Philippines and the United States of America. May the Lenten journey bring us to Easter with hearts purified and renewed by the grace of the Holy Spirit. Upon you and your families I invoke joy and peace in Christ our Redeemer! Saludo cordialmente a los peregrinos de lengua española venidos de España y de Latinoamérica. Pidamos que Dios, el Clemente y Misericordioso —como lo invocan nuestros hermanos y hermanas musulmanes—, impulse el diálogo interreligioso y fomente los lazos de fraternidad que nos unen como hijos de un mismo Dios. Que el Señor los bendiga. Witam pielgrzymów polskich. Dziękuję wam serdecznie za modlitwy w intencjach mojej podróży do Maroka. Spotykając chrześcijan i muzułmanów zachęcałem ich szczególnie do braterstwa, by stało się ono powszechne, wszak jego źródłem jest Bóg. W dniach Wielkiego Postu wypraszajcie dla nich i całego Kościoła ten Boży dar podczas waszych rekolekcji, nabożeństw Drogi krzyżowej i Gorzkich żali. Bądźcie sługami nadziei, której tak bardzo potrzebuje świat. Z serca wam błogosławię. Today marks the 6th World Sports Day for Peace and Development, called by the United Nations. Sport is a universal language that embraces all peoples and helps to overcome conflicts and bring people together. Sport is also a source of joy and great emotions, and it is a school where virtues are forged for the human and social growth of people and communities. I wish everyone to "get involved" in life as in sport. I am pleased to welcome the participants in the Rector Course and Vice Rector of Major Seminaries in Mission Territories; as well as those at the International Study Seminar "The Family as a Place of Growth". I welcome the faithful, together with the Administrators, Associations and School Groups who are taking part in the peace project: "Amico ulivo - Albero del Amicizia". I greet the parish groups, in particular those of Grosseto, accompanied by the Bishop, Mons. Rodolfo Cetoloni; of Funds; of Filetto; and of Gragnano; the Italian Center for Salesian Women's Vocational Training; the Scout Agesci Group, from Villanova di Castenaso; and educational institutions. The Lent we are experiencing encourages rapprochement with God. 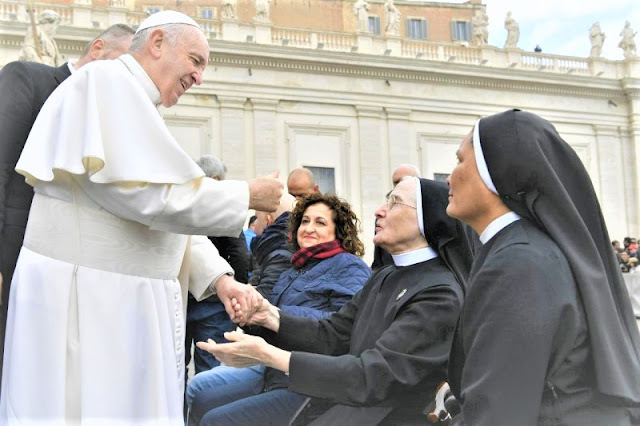 It is a precious time to rediscover the importance of faith in daily life, which, lived through the exercise of works of mercy, revives in us the love of the Father and makes us more aware of the needs of those in need.